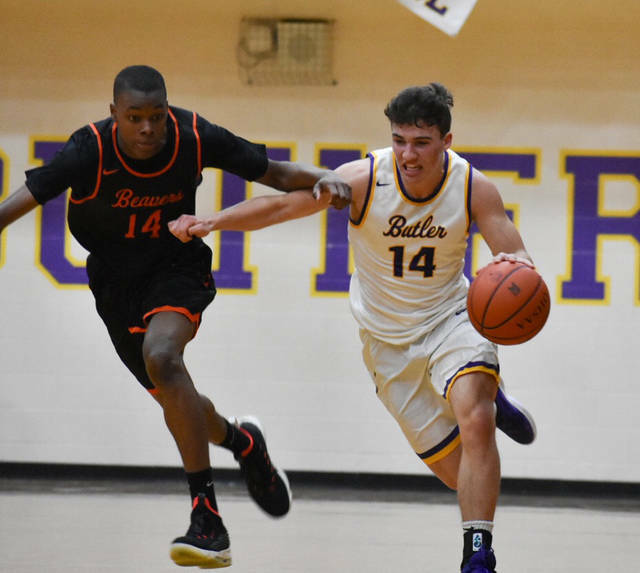 Michael Kreill hit a three-pointer with 8.5 seconds left in regulation to force overtime as the Butler Aviators defeated Beavercreek 58-55 in overtime on Friday. A steal and layup by Tyler Montegue helped seal Butler’s overtime win over Beavercreek on Friday. Ryan Wertz led the Aviators with 13 points as Butler defeated Beavercreek in overtime on Friday. VANDALIA — Good basketball teams find a way to win games even when things aren’t clicking on all cylinders. That was never more true than Friday night as the Butler Aviators hosted Beavercreek. 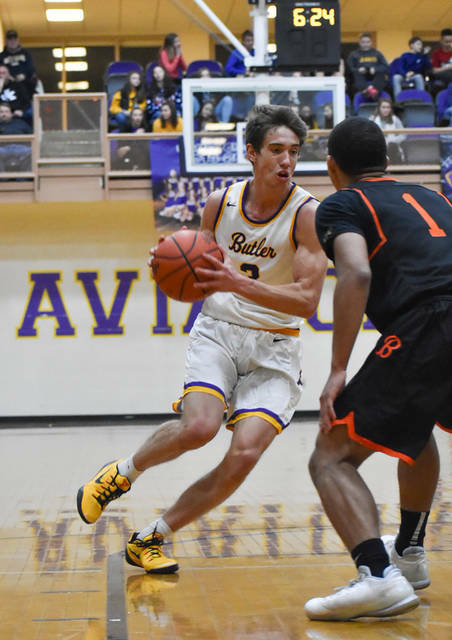 After surrendering the lead midway through the first period, Butler trailed by as many as 13 points over the final 6:07 of regulation until a three-pointer by Michael Kreill with 8.5 seconds forced overtime as the Aviators outlasted the Beavers 58-55 in overtime in a GWOC crossover game. In all, the Aviators outscored the Beavers 21-5 over the final 6:07 of regulation and four minutes of overtime to claim victory. The win improved Butler to 14-2 on the season and they remained 8-2 in league play while the Beavers fell to 5-10 overall and remained 2-6 in conference. 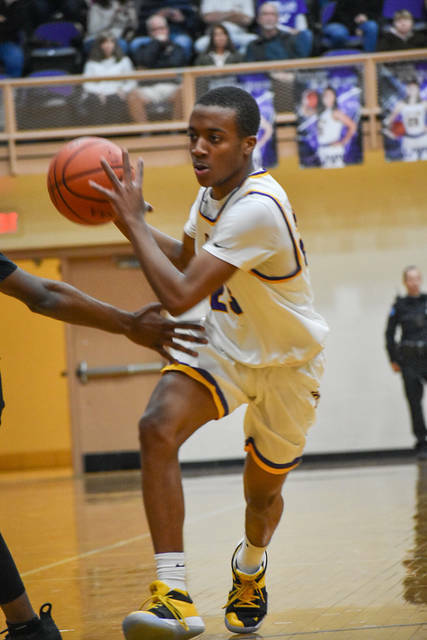 Ryan Wertz led a balanced Aviator attack with 13 points, Kreill had 12, Tyler Montegue had 11 and Bryant Johnson had 8 while Braedon Norman and Quentin Glover had 6 each. This one wasn’t easy from the start. Butler held a pair of two point leads in the early going, but Beavercreek connected on a trio of three pointers to close the first period on a 12-4 run to take a 17-10 lead. They extended that lead to as many as 10 at 21-11 before a 7-0 run that included baskets by Kreill, Cooper Justice, and a three by Tyler Montegue forced Beavercreek to call time with 4:21 left in the half holding a 21-18 lead. Butler cut the lead to one at 23-22, but a technical foul blunted the Aviator momentum and the Beavers took a 31-27 lead into half. Butler struggled to keep the Beavers off the offensive glass, and that hurt them in the third quarter especially as Beavercreek eased out to a 6 point lead at 37-31 and had little trouble maintaining it. One particular sequence at the end of the third period saw the Beavers pick up three offensive rebounds and a pair of free throws to take a 45-37 lead. Butler failed to get a shot off on the ensuing possession and the Aviators entered the fourth quarter looking at their largest deficit of the season except versus Trotwood. That deficit ballooned to 13 points with 6:07 to play after a Creek three-pointer and another offensive rebound and put back by the Beavers. The visitors called time which ended up benefiting the home team instead. Out of the timeout, Butler had renewed defensive effort which was aided by back to back three pointers by senior guard Braedon Norman. Butler forced four turnovers and went on a 12-0 run to close to 50-49 over four minutes that finally ended when the Beavers hit a tough shot with 2:12 to play. After a pair of free throws, the Beavers led 54-49 but the Aviators closed regulation on a 5-0 run aided by a pair of Beaver turnovers and timely misses at the free throw line. Butler still trailed by three after the last miss and Kreill ended up wide open at the top of the key thanks to a screen by Bryant Johnson and there was little doubt the shot was in. Beavercreek had the ball with 8.5 seconds left but settled for a wild shot that had no chance of going in. In the overtime, Montegue slipped to the basket to give Butler its first lead since the opening quarter and never surrendered it. The sophomore guard got a steal and a layup with 13 seconds left that gave Butler a 58-55 advantage that ultimately proved to be the final score. Butler will return to GWOC North play on Tuesday when they host Piqua at the SAC. The Aviators handled the Indians 72-38 in their season opener on November 30. Tip time is set for 7:30 p.m.